We believe happier cows make better milk, so our goal is to have the happiest cows in Colorado! Keep reading to learn how our cows are treated with the udder-most respect. It’s actually very clear cows love being milked. Some cows sneak on the rotary and try to get another ride; and it’s no surprise to see a cow pushing their way back into the parlor. Cows are housed in sand-bedded free-stall barns and corrals where they have ample space to walk and run in the Colorado sunshine. Corrals are cleaned often, and all free-stall barns are bedded with sand to keep the cows dry and clean. Each cow has plenty of space to lay down, eat, and play as she wishes. Even with the freedoms they have on the ranch, cows often prefer to just relax, choosing to be in the barn closer to their food, where temperatures are more desirable. The free stall barns have dropping side panels which are used on cold, windy days to keep them warm. On the hot days of summer, fans are turned on for the cows and side panels are rolled up on the barns to make it cooler. Our facilities are newly remodeled, truly a cow palace! As for grazing, our herd will be able to grass-feed on the seasonal pastureland once construction is over. In the meantime, the cows are eating a ration of alfalfa hay, corn flakes, corn silage, and other minerals grown on our farm or sourced locally. The cows are fed a buffet 4 times a day in their free-stall barns; and they love it! Our calves receive a great deal of special attention. Calves have their own straw-bedded hutches in which they stay for the first few months of their lives to keep healthy and safe. Like human babies, calves are safer in a “play pen” type setting where they can’t get lost or be stepped on. In the winter, calves are housed in a warming until they are strong enough for their own hutch. On really cold days they get to wear insulated jackets! After a few months in their own hutches, calves are housed in the “teenager pen” and spend time with a group of heifers their own age. Once heifers are socialized and our herdsman think they are ready, heifers are transferred to our corrals, where they live until they are ready to start producing milk. This process of graduated socialization and independence provides a stress-free, safe environment for our cows. All the pens are located right on our farm meaning our heifers never have to travel far. In addition, almost all heifers and cows are Morning Fresh born and raised. This ensures our dairy cow family is raised stress-free, all-natural, and treated well their entire lives. We believe happier cows make better milk. Our goal is to have the happiest cows in Colorado! As for the milking process, our cows really could not have it any better. 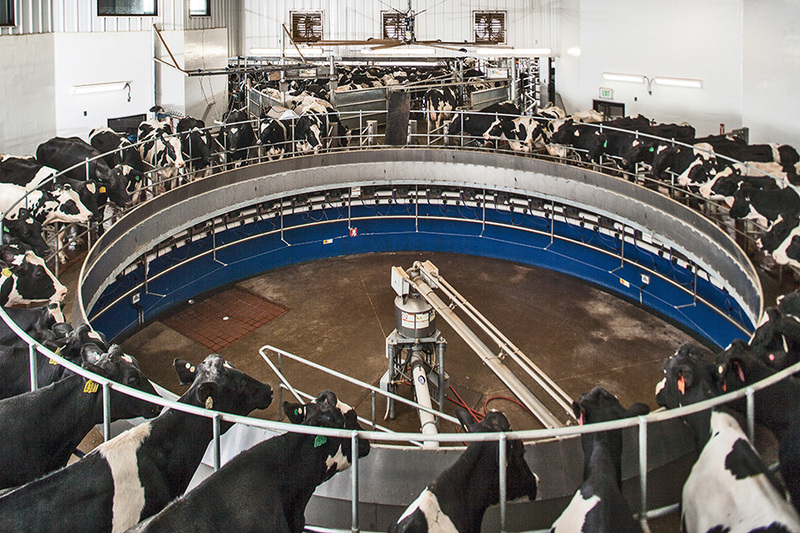 Built in 2015, our cows are now milked in a rotary parlor. In this new parlor, cows look at each other while being milked—making them feel comfortable and safe. The rotary moves very slowly and each cow knows when to get on and when to get off of the rotary without assistance. The milk machines are very consistent which is ideal for cows who love predictable regular routines. It’s actually very clear cows love being milked. Some cows sneak on the rotary and try to get another ride; and it’s no surprise to see a cow pushing their way back into the parlor. You’ll just have to come see for yourselves! Thanks to Colorado State University, our cows receive cutting edge veterinary care from experienced veterinarians and their students. Veterinarians are present at our dairy at least three times a week ensuring our herd is as healthy as possible. The DVM Program at Colorado State University prepares students for careers in the veterinary field in a world-class facility in Fort Collins, Colorado. 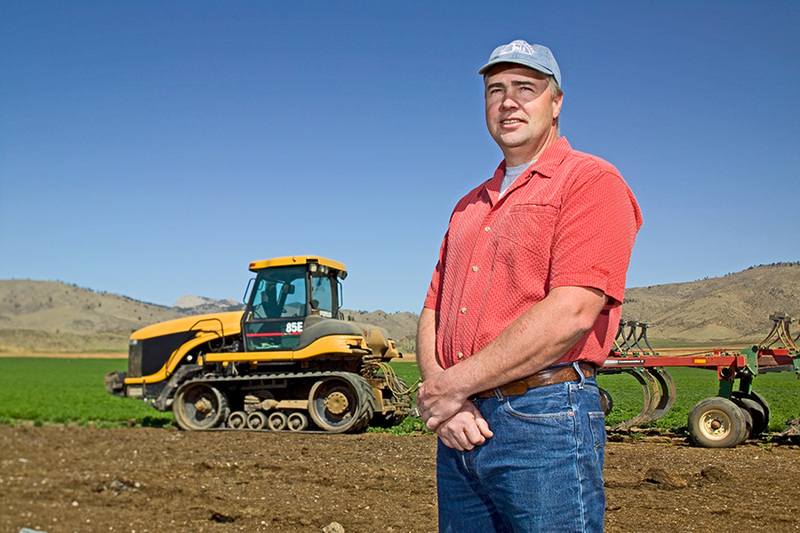 Do you have a question for Farmer Rob? Contact us. How many cows does Morning Fresh Dairy have? We have a wonderful cow-munity! We currently milk about 1,000 happy healthy cows. How much milk can one cow produce a day? Our cows produce about 10 gallons a day. How many times a day does each cow get milked? Our cows happily get milked three times a day in a rotary parlor. What does Morning Fresh feed their cows? We grow corn and alfalfa hay in Bellvue and eastern Colorado without the use of pesticides. Composted cow manure is used as fertilizer on our fields. We supplement our home-grown feed with other essential nutrients and proteins such as soy bean meal, cottonseed, and minerals from nearby farms and local businesses. Does Morning Fresh use antibiotics? At Morning Fresh Dairy, we only treat cows that are ill with antibiotics, pulling them out of production during treatment and recovery. We strongly feel that this is the only ethical solution. We do not overuse antibiotics; however, we do treat rather than destroy sick animals. Does Morning Fresh Dairy use Growth Hormones (rBGH/rBST)? No. We do not give our cows any artificial hormones. What’s the difference between ‘all-natural’ and ‘organic’? Fort Collins is classified as a semi-arid climate. In Fort Collins, and overall in Colorado, the seasons and lack of rain cannot support the pasture requirements for an organic dairy. Our cows are out to pasture as much as possible but not the full 120 days required for an organic dairy. We built the cows’ new barn in 2015 with dropping side panels and sand bedding so we can keep the cows comfortable and clean in any weather conditions. Drinking milk from Morning Fresh Dairy minimizes your food miles. We grow our crops, feed our cows, and bottle your milk all in one location. This means that you are minimizing the miles driven and energy used to produce your milk. We don’t use any preservatives because we are able to get our milk from moo to you in 24 hours. While we do not use 100% organic feed for our cows, we do raise many of the crops used to feed our cows on our fields at the dairy. Come out for one of our tours and see how you feel about the way our animals are raised, fed and treated here at Morning Fresh Dairy. We raise all our own cows and do not use any growth hormones. We partner with CSU to provide top of the line vet care for our animals. Organic standards do not allow for the use of antibiotics. At Morning Fresh Dairy we do not give our cows any preventative antibiotics but we do use antibiotics if a cow is sick. We do not believe in destroying a sick animal that could be effectively treated with antibiotics. However, any animal being treated with antibiotics is pulled from production during treatment. Their milk is not consumed during treatment. We’re very proud that our milk is all natural and fresh and our cows have the best quality of life. Come out for a tour and see the life of the Morning Fresh cow yourself.